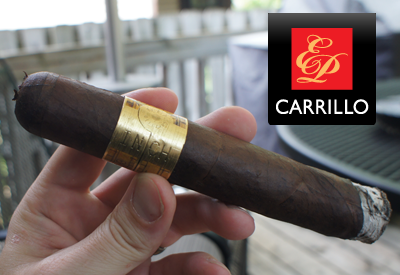 Up for review is the soon to be released (at the IPCPR 2012 tradeshow) INCH by EP Carrillo. Rumors of this cigar have been around for quite some time and, just in the past two months, pictures have begun to surface. It looks like it will take a long time to burn this one down, so let's get to it. The branding on the INCH is a big departure from what EP Carrillo has done in the past and I think it's great. The vintage ruler image on the band is original and very creative. Big props to whomever did this design work. Next let's talk about size. This cigar is an absolute giant. If you thought the MUWAT from Drew Estate is big, it's got nothing on the INCH. I had to find a different cutter than what I normally use to clip this stick. The broadleaf wrapper was dark and spotty with some reddish hues which really showed up in bright sunlight. There were lots of little veins, which is typical for this type of wrapper. The pre-lit aroma gave off some coffee and vanilla scents. The cold draw was nice, free, and had a strong almond flavor. Getting this stick to burn evenly from the start was a bit of a problem, but once I got it going, it produced smoke nicely. The starting profile consisted of dark black coffee on the front, which was very rich, and some mild cayenne pepper on the finish. There was not much spice to the pepper, but a lot of flavor. 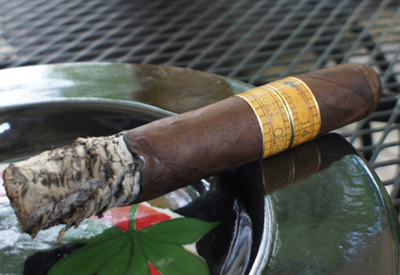 What surprised me about the first third of this cigar was that I got hardly any of the broadleaf taste that I am used to, but I am guessing it's because of the sheer volume of tobacco used in the fill. The smoke itself was pretty thin, which to me was a good thing with this size, because I'm certain something heavy would have rocked me. The nicotine level was in the medium range. 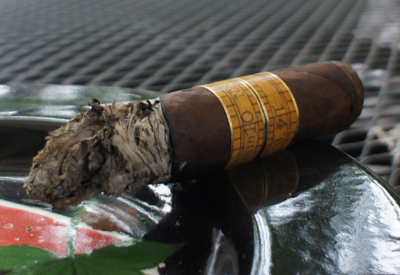 The second third of my INCH from EP Carrillo was where the broadleaf sweetness showed up. The front of the profile still had coffee notes, but now was equaled by a sugary sweetness from the wrapper. The finish lost any pepper it had previously and now tasted strongly of almonds, just like in the cold draw. The burn was pretty wavy and I did have to give it a few touch-ups to stop any running. With a cigar this size, you're gonna have that. Again, the smoke was pretty thin but full of flavor. I'd put the nicotine level up a notch here and say it was in the medium-full range. The final third had a little tweak to the flavor profile in the finish and a big tweak to the nicotine power. This cigar was easily in the full power range at this point and I had to smoke slower to avoid any head spins. The front end was still coffee and sugar, but the finish had a lot of anise in the taste which I didn't see coming at all in the first two thirds of this giant. The smoke also seemed to get thicker toward the end which was a nice, but I'm glad it wasn't like that the whole cigar or it would have felt like a workout. The burn was still pretty wavy, so keep your lighter near. 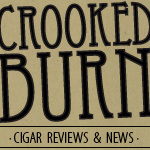 Final thoughts on the EP Carrillo INCH? 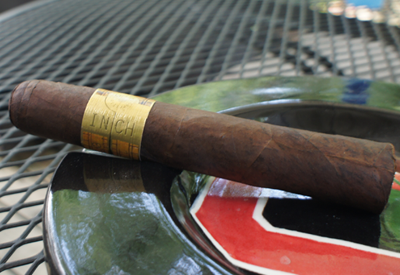 Even with the jaw breaking size of this cigar, I still enjoyed the heck out of it. I'm glad it was blended to not be full-on power the whole way because it would have been too much. The flavors were strong and definitely had some changes through out to keep me from getting bored on such a long smoke. Would I buy a box? This would be a great cigar for tailgating because of how long a smoke time you get out of it, so a box purchase isn't out of the question, but I wouldn't smoke something this large on a daily basis.